To make sure you have enough left in the tank for the finishing sprint, it's important to understand interval training. My friend didn’t know what to expect. He had just arrived in California, and while the weather was great, it was the company that scared him. It was his first ride with Levi Leipheimer and he prayed he’d be able to keep up. They were soon riding the hilly Northern California landscape. My friend, an accomplished mountain biker, was happy to see that he could hang with Leipheimer on the climbs, even if he was at his limit. For two hours they explored back roads while he wondered why their workout was so undirected. Eventually they stopped. With a smile, Leipheimer said, “Thanks for the ride, I have to go do my intervals now.” Just one sentence and my friend learned what being a Tour de France contender meant. The workout hadn’t been undirected. It was just the warm-up. While a quick Google search will bring up hundreds of interval options, they too often just list times and zones. There’s a lot more to it if you want to make your intervals truly effective. So, let’s look at how to optimize your intervals. Back to basics: Aerobic vs. anaerobicVince Lombardi was famous for starting team talks with the line, “This is a football.” The message was clear: never forget the basics. The same philosophy applies to cycling. We have two ways of producing energy: aerobic work requires oxygen and doesn’t fatigue easily; anaerobic work is fast, strong, doesn’t require oxygen and doesn’t last very long. Oxygen deficit can be critical in effectively targeting your intervals. Being in oxygen deficit generally means your aerobic system is not being fully stressed. If you are doing purely aerobic-focused work such as threshold intervals and you spend the majority of the time in deficit, your power numbers might be great, but your workout wasn’t. On the flip side, intervals targeting your anaerobic system should maximize oxygen deficit. Anaerobic power: The big spenderThink of the fastest anaerobic animal on the planet, the cheetah, capable of running at 70 mph. Now think about what it’s doing when it’s not hunting down some slower prey — it’s laying around. We can produce a lot of anaerobic power, very fast, but it doesn’t last long and it takes time to recharge. While you have to do work to activate aerobic pathways, the best way to prepare for anaerobic work is to do nothing. Fortunately, the aerobic system is as slow shutting down as it is starting up. As a result, prior intervals create a “priming” effect that reduces oxygen deficit in subsequent intervals, provided the recovery length is short enough. For threshold intervals, recoveries of 1-3 minutes are optimal to ensure some recovery while limiting oxygen deficit. Even getting the aerobic system primed at low intensities takes time. Give yourself at least 20 to 30 minutes of easy to tempo riding before starting your threshold work. While you can put out your best watts in your first threshold interval, it’s because of your heavy reliance on anaerobic energy. In terms of training, most of that interval is spent in deficit. It’s the later intervals where you produce your best training stimulus. So, don’t hammer the first interval. All you’ll do is reduce the quality of the intervals that count. I’ve seen many riders start strong and get slower with each interval. That’s because their anaerobic reserves are depleting and they never fully utilize their aerobic system. Make sure your intervals are a consistent intensity. Target the exact same wattage or pace (on a flat road) for each. Done correctly, the first interval should feel hard, but not unbearable, and your heart rate will be a little below your threshold. By the final interval you should struggle to maintain pace. What should you do in the recovery periods? Keep the legs spinning between threshold intervals. This will keep the aerobic system primed. Active recovery will also aid lactate clearance. While cycling is an aerobic sport, anaerobic power can still be the difference between a podium and middle of the pack at the end of a race. Sprint intervals are the best means of training anaerobic power. Says Pickels: “If you’re trying to achieve those high powers, you need long recoveries. Accumulating oxygen debt is going to destroy that high power. There’s no point doing a sprint workout if you hit 1,000 watts and then 800 watts, and then 600 watts.” Recoveries should be as long as four or five minutes between sprints to recharge your anaerobic pathways. Watch track sprinters train and you’ll see them spend lots of time sitting around. Letting your anaerobic system recharge for the next interval means doing as little as possible with your legs. Get off the bike and sit if you have to. Limit your warm-up to 10-15 minutes and go home as soon as you’re done with your intervals. The entire workout should be around an hour at the most. There’s 20 minutes left in the race. Someone just attacked and you have to sprint to catch on. But then a precious few seconds later another attack goes up the road. We’ve all been there. Spend too much of that last 20 minutes in deficit and you’re in trouble. Fortunately oxygen deficit, like most systems, can be trained if it’s stressed. “Training oxygen deficit is the thing that a lot of people are going for now and seeing huge increases not only in VO2 max, but in submaximal performance as well,” said Pickels. To maximize the oxygen deficit, efforts need to be short and all-out, generally 20 to 30 seconds. However, the recoveries need to be equally short to prevent anaerobic pathways from recharging. Common intervals are six to 12 repetitions of 30-30s (thirty seconds on, thirty seconds off) and 20-10s. Trevor Connor is a long-time cycling coach and researches both exercise physiology and nutrition at Colorado State University. Anyone who has ridden Steaming Nostril will tell you about the pain that awaits on the snowy, icy, wet and mud filled rail trail. The pain of doing it once isn’t good enough. After having clawed your way out of the rail trail, racing 60km of snow covered dirt and gravel roads, you’re forced to ride the trail one more time before crossing the finish line. The return trip is where most people are “broken”. Pictures often reveal pain filled and desperatefaces. This year’s race lived up to its name with temperatures well below -10 on the start line. With a better understanding among all riders of the importance of getting onto the rail trail at the head of the bunch, the neutral start was not so neutral but I was able to get onto the trail with the lead group. There were already some deep ruts in the snow covered trail - which was nerve-racking in this fast paced group. I did my best to stay attached to the back and prayed that Nathan Chown did not attack off the front – as there would be no way I could respond. The lead group came out of the rail trail with roughly 20 riders which included Nathan Chown, Peter Disera, Mark Brusso, Tim Marshall and Peter Morse. And in what is certainly the Rule #5 award of the day, Gaelen Merritt broke away solo almost immediately after leaving the trail – and stayed away for the rest of the day. The group was never able to organize itself. From what I could see from my sheltered attempt to do as little work as possible, two riders from Morning Glory Cycling Club, Tom Nesbittand Kevin Higgins, did the majority of the pace setting. With Gaelen becoming little more than a dot on the horizon, there were a number of attacks in the peleton. Nothing stuck until Tom Nesbitt made his second attempt to get across. As Tom started to disappear into the distance, I looked around the group seeing Chown sitting very comfortably and knew that if I didn’t come into the trail well ahead of these guys I was going to have no chance. So I jumped. I didn’t let myself look back until I had made up half the distance to Tom. When I did, the peleton was well off in the distance. I’ve got to be honest, without Tom’s work, I would never have made it across to Gaelen. It was clear that Tom had given everything to get us to Gaelen. As he came through to take his pull and I immediately came around him and told him to take another one off but the effort to get across had cost him too much. Tom was off the back and it was just Gaelen and myself left. Gaelen and I were able to build up a 2 minute lead on the peleton. As we prepared to re-enter the rail trail and make the short trip to the finish, we wished each other luck knowing that cooperation would no longer be of much benefit. I came into the rail trail first. There was no big attack. I just road as fast and as hard as I safely could. The trail was much smoother and faster than on the way out but I was too afraid to look back for fear of crashing. When I finally exited onto the road, I looked back and I was on my own. I crossed the line and won my first race of the year. I want to thank my team Real Deal Racing and sponsors Gears,WASPcam, Feildgate Homes,Toronto Sport and Social Club,Morning Glory Cycling Club,Champion System, PowerBar,Balance Physiotherapy, RPM Total Fitness, Spin Kicks, Kenzington Burger Bar and Barnstormer Brewing for their help in getting me on the podium. 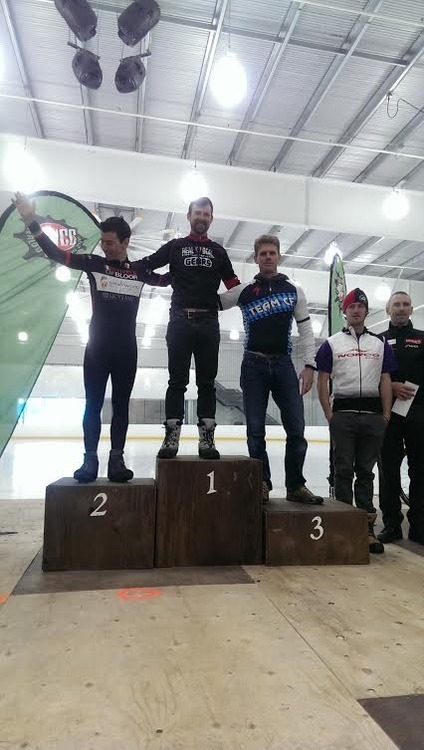 I also want to thankCycle Waterloo for hosting Steaming Nostril and making this great race happen.